Prayer is a key foundation stone for any church. 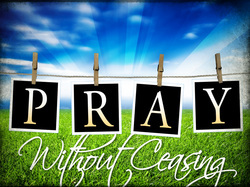 At New Life Church, we recognize the importance of a living relationship with God through prayer. He interacts with His people through prayer. Our relationship with our Lord grows as we grow in prayer. Jesus said, “My house shall be a house of prayer for all nations”. It is our sincerest desire that New Life Church be this “house of prayer” our Lord spoke of and that we will be a “prayer-saturated church”….that all decisions and needs be bathed in prayer, that we become “listeners” to God in prayer and not just “talkers”, and that prayer be a regular part of not only our church life but our personal lives as well. We recognize the power in prayer, not only for the “grown-ups” but for our smallest children as well. We all need to learn to pray and continue our growth in prayer throughout life. If you would be interested in growing in prayer through a study or resources, or in becoming a part of the Prayer Ministry Team, see or email Jean Webb. The Prayer Ministry Team meets every Monday at 6:30 PM at New Life Church to pray over requests submitted as well as the needs of our church, our community, our nation, and the world. If you have prayer requests, they can be submitted through this web site or placed in the prayer requests box in the foyer, or mentioned on the Communication card.